A good time to start taking better care of your feet is today and possibly you may avoid getting charcot foot, or possibly heal the condition... Charcot foot is described as neuroarthropathy of the foot, which typically manifests in the forefoot, mid foot and ankle region. This presents as hot red swollen foot that may be misdiagnosed as an infection or gout in the early phase with or without mid foot collapse. • Non-weight bearing on affected lower extremity until diagnosis confirmed. High risk diabetic foot is a general term used to describe a variety of foot problems related to diabetes mellitus that may result in limb loss if unmanaged. 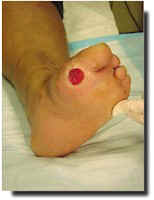 These complications range from skin fissures to large non-healing feet ulcers that commonly originate from shoe related blisters or unidentified trauma and may potentially lead to amputation. Other factors that contribute to diabetic foot complications include: peripheral neuropathy (light touch, motor and autonomic), deep or superficial infections, structural changes and deformities (i.e., hammertoes, bunions, osseous prominences, Charcot joint, etc. 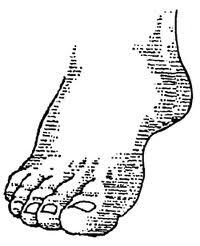 ), arterial and venous insufficiency, traumatic foot or ankle injury, or due to a foreign body. 4. 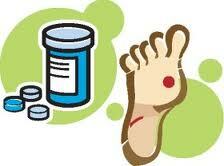 Peripheral or diabetic neuropathy medical conditions. 5. Inability to find shoes which fit due to deformity, recurrent shoe gear related ulcerations, instability, or sensitivity. To decrease the rate of toe, foot, and lower extremity amputation in the diabetic population with referral of those patients considered to be at high risk for developing ulceration, infection, and Charcot foot deformities, to a group of extremity specialists who focus on mechanical, medical, and surgical intervention in the treatment of the diabetic foot and lower extremity. Any diabetic patient with ulcerations, signs of foot infection, traumatic injury, presence of a foreign body or suspected charcot foot should be referred as an ASAP. Click-here for Health Tip-of-the-Day. Patients with a combination of one or more of the signs and symptoms identified in the Initial Diagnosis and Management above should be referred as potential high risk to Mary Anne Landowski, RN who will perform a detailed foot evaluation and arrange for appropriate care. After any acute extremity related problem has been appropriately treated. Patients found to be at high risk for foot ulcerations should be followed in the Limb Preservation Service at intervals determined by the clinic providers in conjunction with the Primary Care Provider. These follow-up intervals will change based upon the progression or regression of the complications identified in each specific patient. All patients should be followed by the primary care provider for treatment of all co-morbid conditions and routine care with the goal of optimal health and wellness for the whole patient. Improper or poorly fitting shoes are major contributors to diabetes foot ulcerations. Counsel patients about appropriate footwear. Patients with diabetes need to pay special attention to the fit and style of their shoes and should avoid pointed-toe shoes or high heels. Properly fitted and comfortable athletic, or quality walking shoes and sandals are highly recommended for daily foot-wear. If off-the-shelf shoes are used, make sure there is room to accommodate any foot deformities.